Episode 31: You Are Not Your Painting! It’s natural for us to get attached to what’s happening in our painting process whether we like it or not. This episode looks at our tendency to fixate on ideas about what’s happening rather than allowing ourselves to freely experience creativity in the moment. An excerpt from You Are Not Your Painting! . . . Some of the deepest revelations that we have in process painting have to do with the nature of self identification, the ways in which we become attached to the content of the painting and identify ourselves with it. 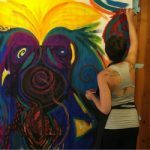 For example, we may start off with a certain color and texture on a new painting, and we find ourselves liking it: I really like the way that texture is showing up and there's something about those brush strokes, and I take another color and I find that I can do it with another color the same brush stroke. There's a delight. This is a very innocent and natural experience to have in the painting process, but something starts to take form underneath. We find ourselves beginning to be attached to that particular texture and the way the brushes are moving and we start to form a plan. This all happens unconsciously, we don't even see it, these tendencies of the mind to take over the experience: This is going to be a painting that has that texture throughout. It's going to change a little here and there, and the colors are going to meld with each other. I find myself creating a form that I get attached to, an idea that hasn't even fully manifested yet. I begin to mold my experience around that idea, around that projection. More so I begin to mold my sense of myself around that projection. This is something not so easily recognized. We don't see how the very stance that we take in the painting process, the very stance that we take about projecting into the future creates a sense of self, and we're threatened if it doesn't happen. In doing so we diminish greatly the freedom that's possible in the moment, because the serendipity no longer has a place, that which comes through the intuition and isn't at all concerned with whether that texture maintains itself and continues. Related: Also see the blog post You Are Not Your Painting!